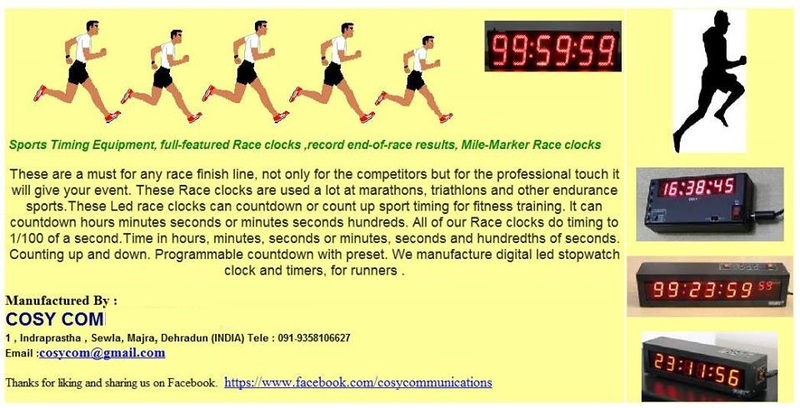 Manufacturers & Exporters of Digital LED Stopwatch Clocks, Token Number Displays / Queue Management Systems, Sports Timing Equipment, Race Clocks, LED Sports Clocks, Time & Date Clocks. 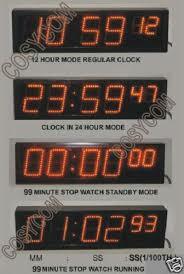 Sports Timing Equipments, record end-of-race results, Mile-Marker Race clocks. TT Bank transfer. For PayPal payments click Buy Now button below. IMPORTANT: Pl. inform your complete shipping address and contact number after sending the payment. Attractive Big Size High bright RED LED Characters . Indoor or outdoor use . 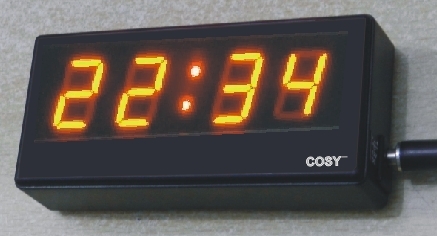 Selectable 12 or 24 Hour Display Format. Internal Battery backup maintains time during a power failure ,the clock will start to display accurate time as soon as the power is restored. Black powder coated Aluminium frame . Simple push buttons to set time . Runs with 12 volt DC supply ( ideal for use in Automobiles , Ships etc. and remote locations to operate with 12VDC automobile battery ). Highly Recommended for : Large Offices, Shops, Hotels & Restaurants, Factories Sports and fitness centers, Automobiles , Ships etc . ( Inches ) Model No. For customers within India, GST @ 18% will be charged extra. Shipping charges are included.